If you have never been to Cooperstown it is a picture-perfect-postcard mountain valley community nestled in the foothills of the Catskills. On the town’s website the tagline is: Believe It Or Not This Is Cooperstown. They can get away with this grand statement because everywhere you look, you think: Is this really, real? This part of the family is resolutely athletic and Catholic. I like to think of them as our family’s Kennedy’s. We were there less than 48 hours during which there was soccer, golf, basketball, baseball and Sunday school, which Carolyn teaches. The kids play a combination of 6, 7 or 8 sports—I lost count. Their rooms have trophies the size of lamps cramped on their dressers. 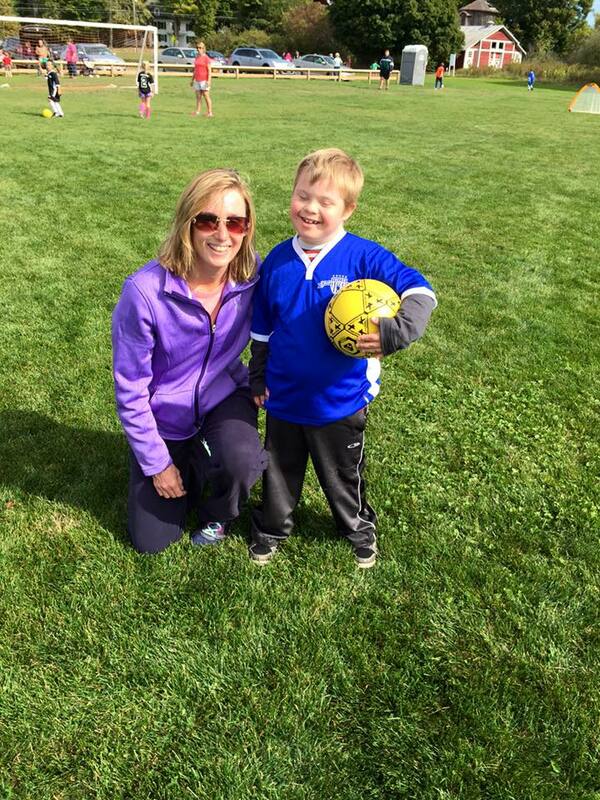 On Saturday, Thorin was pulled into Ben’s soccer game by the coach, aka Aunt Carolyn. A jersey was quickly found and thrown on Thorin as he entered his first soccer game ever. Thorin pumped his legs hard to keep up with what was a spirited game. 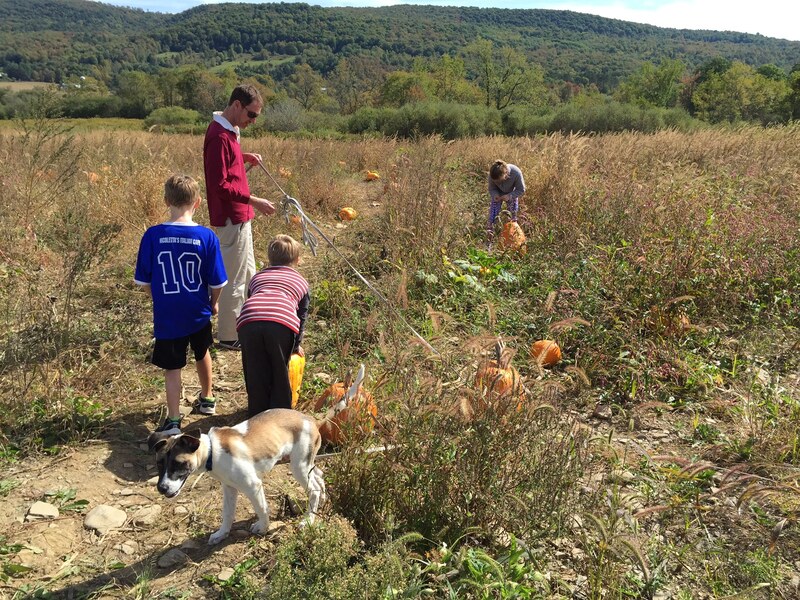 Following that we went to pick pumpkins and apples. On to a local brewery for beer and fries and then umpteen games of catch and some basketball followed by a leisurely dinner. This whole group moves non-stop until they fall into a tangled heap on the couch all vying for the spot closest to Wrigley. Last weekend that also included Thorin who was included in everything. And– if he needed a little extra help he was asked if he wanted it. 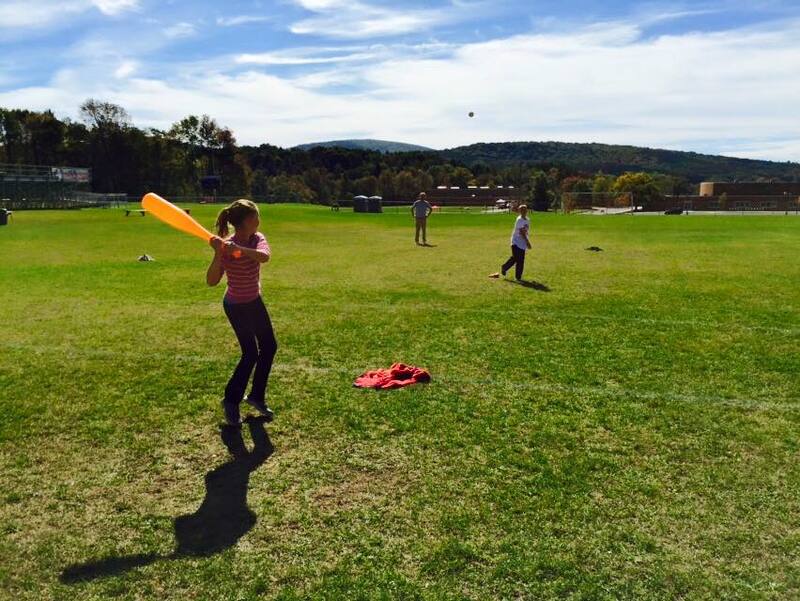 I am a non-athletic, non-Catholic but being with them including playing in the family’s impromptu baseball game made me feel both sporty and spiritual. I also loved the small town-ness that was evident in everything. Ward yelled back: “Has anyone here heard of pagers?” No response. Most of the conversations revolved around sports with departures to include discussion of Pope Francis U.S. visit; and even one cross-over mention of both sports and religion. During lunch baseball, football, basketball, soccer, karate, golf, curling, competitive dancing and gymnastics were loudly discussed and assessed. Everyone agreed curling should not be included in the Olympics. Spencer mentioned a Catechism teaching on LaVar Arrington’s comparison between Leonard Fournette and Bo Jackson. I didn’t understand any of it but it seemed terribly important to all of them. 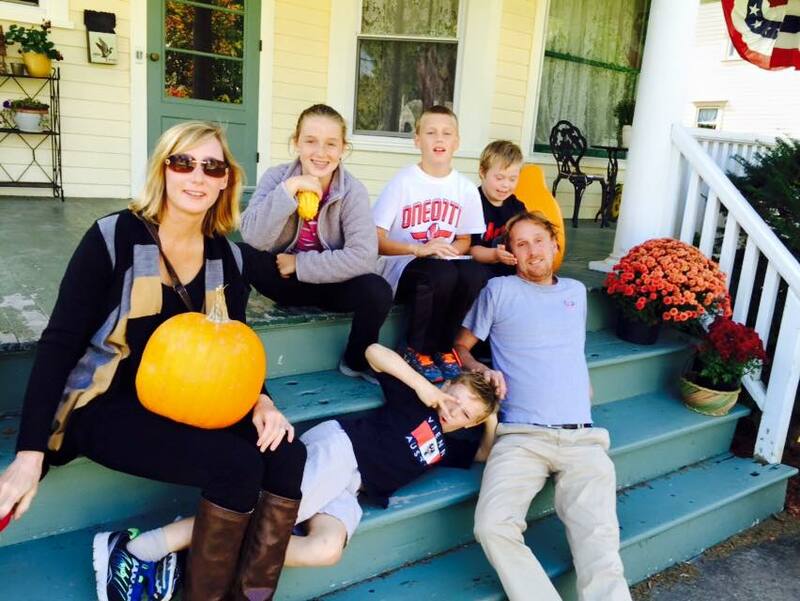 Carolyn reminded Andy of Harvest Night – a community-wide dinner—where residents eat side by side along Main Street. 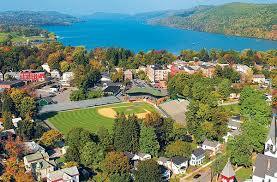 Believe It Or Not This Is Cooperstown! Basking in the glow of it all I announced: “We should move here!” It’s a lovely feeling to be caught up in the moment of an idyllic world. Soon after though, we reluctantly left their Camelot. But, first what I already knew– Ben’s soccer game which took place in nearby Pathfinder Village included the presence of a photographer who photographed Thorin along with the other players covering the soccer games for the community. Carolyn sent us a link to the Pathfinder Village Facebook page to see the photos of Thorin. Landing on their page I discovered Pathfinder Village is a planned-community for people with Down syndrome. When I went to their website and discovered that my brother-in-law, Phil, is a on their board of directors. No one had made mention of any of that. It made me realize they see Thorin’s Down syndrome as important but not remarkable. That may well be a perfect definition of inclusion. Sadly and tragically –we also heard that yesterday Wrigley had been hit by a car and killed. My heartbreaks for them all. I couldn’t help but think about all those games Wrigley would miss watching them play from the sidelines to then go home and sleep soundly, snuggled among them. 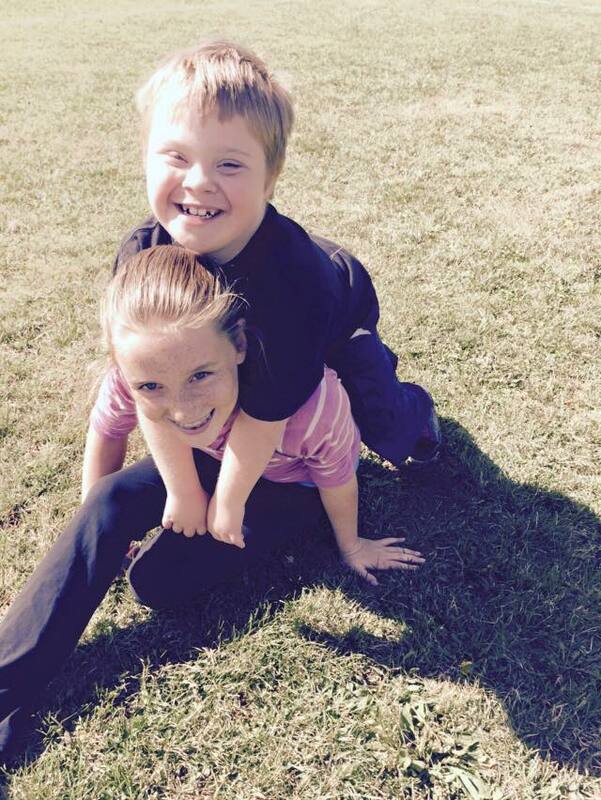 This entry was posted in Advocacy, Cooperstown, Down syndrome, Down syndrome community, homeschooling, Inclusion, Pathfinder Village, The National Baseball Hall of Fame, unschooling and tagged Cooperstown, Down syndrome, Down syndrome community, homeschooling, inclusion, New York State, Pathfinder Village, The National Baseball Hall of Fame, unschooling by Kari Wagner-Peck. Bookmark the permalink. I tapped like and then read about Wrigley. Talk about a gut wrenching ending!